While they were announcing the names of the runners-up for All Island Best Speaker 2012 Sheshadri Kottearachchi was already planning on what she would speak about the next year. 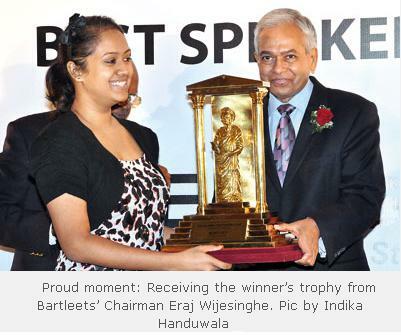 So when a few minutes later they called her name, there was a slight moment of confusion before it sank into the 20-year-old that she had won the coveted Bartleets Trophy for the Toastmasters All Island Best Speaker contest 2012. She’s not being modest when she says she was ‘absolutely shocked’. “I couldn’t believe it!” she grins. “The other four finalists were so good, and for me to win was definitely not something I expected.” Kavitha Gunasekara and Shyara Bastiansz were the first and second runners-up. Speaking to an audience is not exactly something Sheshadri is a novice to. The second round of impromptu had all five contestants tackling the topic of ‘Love and War’. Sheshadri chose to speak about an old man and a young boy on the streets, and how fiercely the young boy took care of his grandfather. ‘We’re all warriors fighting for what we love in this life,’ she concluded, drawing thunderous applause from the 500-plus audience at the Galadari. One day, Sheshadri will make the best of use of her public speaking skills by going into diplomacy. Following an International Relations Diploma and a Diploma in French, she’s already making some headway towards her ambition. And right now? She’s just going to sit back and bask in the glow of her tremendous achievement. The 23rd annual All Island Best Speaker Contest was held on June 10 at the Galadari Hotel, amidst a 500-strong gathering for the Colombo Toastmasters Club. The Chief Guest was High Commissioner for Great Britain and Northern Ireland John Rankin, and Guests of Honour Haleem Ghouse (a founding member of Colombo Toastmasters) and Eraj Wijesinghe, Chairman of main event sponsor Bartleet Group. Round one saw the five finalists Haris Omar, Kavitha Gunesekara, Dilara Liyanagama, Shyara Bastiansz and Sheshadri Kottearachchi take on the prepared speech category, while Round Two saw them tackle the impromptu topic of Love and War, with a preparation time of 20 minutes. In the prepared speech category, the contestants each strove to make a strong point with their allotted seven minutes. ‘Chikin Boom’ (Haris Omar), ‘Name Your Price’ (Kavitha Gunesekara), ‘the Steering Wheel’ (Shyara Bastiansz), ‘Dog is a Man’s Best Friend’ (Dilara Liyanagama) and ‘My Love Story’ (Sheshadri Kottearachchi) resonated with the audience, drawing applause. Impromptu Round saw the five contestants take different perspectives on the common theme ‘Love and War’; taken from the settings of a Chinese restaurant and a kindergarten classroom to a dusty pavement, the two-minute monologues held the attention of the an appreciative audience, thanks to the often humorous perspectives taken by the speakers. The panel of judges comprised Viran Corea, Rohini Nanayakkara, Feroze Kamardeen, Varuni Jayasekara and Lilamani Dias-Benson, together with Chief Judge Asgi Noordeen. The event was compered by Yukthi Gunasekara, who added a touch of humour to the evening.